So you’ve listed your product to Amazon. Great! Now all you have to do is sit back, relax and watch the sales come in, right? Not quite. The reality is, your listing is up against 606 million other products by more than one million other sellers—and that’s just in the U.S.
Amazon is a congested marketplace. But there are steps you can take to improve the visibility and conversion rate of your listings, especially as Amazon is trying to tighten control of its fast-sailing ship by rewarding sellers with the most optimized listings and operations. 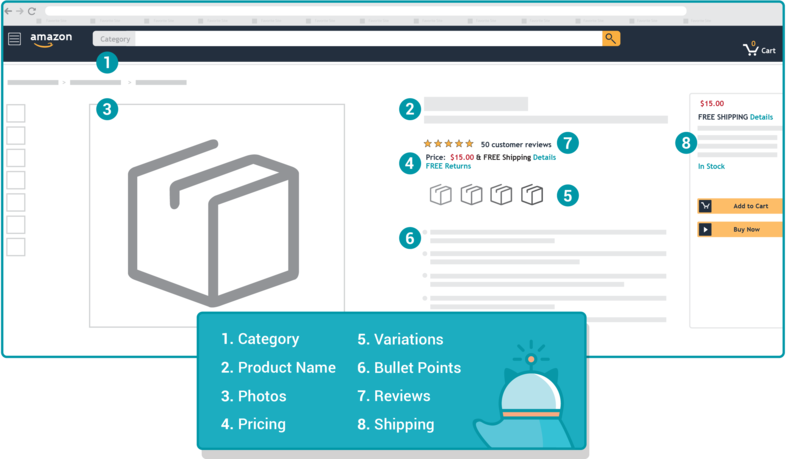 What are the essential traits of a successful Amazon product listing? Choosing the right Product Category is critical to your keyword ranking and discoverability. But between open and restricted categories, Amazon’s ongoing updates to browsing pathways, and the hundreds of existing subcategories that you can choose from, it can get confusing. When this happens, avoid throwing in the towel and arbitrarily picking any ol’ category. Consult Amazon’s Overview of Categories or contact seller support. Some sellers will try to game Amazon by picking a less competitive category that’s somewhat related to their product. Avoid this! Amazon may hide your listing from buyers—without so much as notifying you. For bigger catalogs, consider automation via Zentail’s highly coveted SMART Types to accurately classify SKUs based on advanced attributes. Make sure your listing is properly set up to show all the variants of your product, e.g., size or color. Avoid splitting up your variation into multiple listings and risk losing sales as a result of requiring shoppers to hop around or re-enter their search to find the exact item they’re looking for. That being said, you can create separate alias ASINs for prepackaged kits or bundles. You’ll want to make sure that your workflow or inventory management software can properly track orders of your kits (see tip #10). Like Google, Amazon crawls your listings for keywords to surface relevant search results. In fact, Amazon says that every word in the product title is searchable on its own. Here’s the catch: You can’t simply stuff your listing with keywords. You have to sound human while playing by Amazon’s algorithmic rules. You must win your buyer’s click in addition to catching their eye. In general, including your root keyword once in your title and your description is good. Adding related keywords is even better. For example, if you’re selling a jacket, use synonyms like “coat.” Consider looking at other listings in your category or performing more extensive research to find keywords to target. Amazon may surface your listing for multiple search terms or categories, increasing your product’s exposure. You can also leverage Amazon Backend Keywords (i.e., “hidden” keywords) from your Seller Central Account to improve visibility. Add keyword variations, like colloquial terms, abbreviations, common misspellings or generic keywords that didn’t make it into your actual listing here. If you’re a Platinum Merchant, you can include your platinum keywords. You’ll be limited to 250 characters in Amazon US, though this limit has been changed many times over the last few years. Amazon further advises that you avoid putting competitor ASINs, product or duplicative words (between multiple backend keywords and/or the words already used in your listing) here. The Key Product Features section is one of the first things your customers will see when landing on your listing. You can have up to five bullet points, 500 characters each. However, you shouldn’t overload this section. Highlight the most important details or advantages of your product. Put yourself in your customers’ shoes and use their language, speak to their lifestyles and touch on the questions they may have prior to purchasing. For instance, if you’re selling a skincare product, you’ll likely want to address the ingredients used in your product (though it’s not required by Amazon) and if it’s suitable for people with sensitive skin. 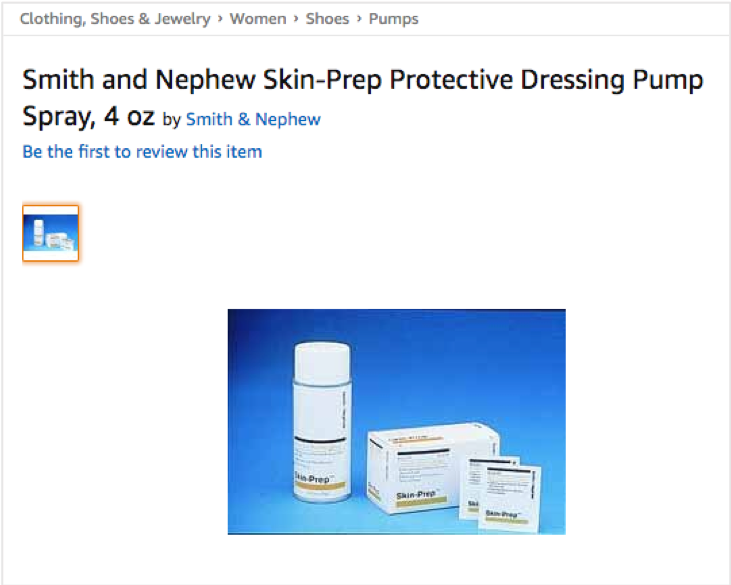 In terms of keywords: While Amazon claims that bullet points in the Key Product Features sections are not used to determine rankings, there is anecdotal evidence that putting keywords there help. It can’t hurt to try, so consider folding them in only if it makes sense to. Title Length: Amazon generally favors shorter titles (~50 characters) even though you have the option to write titles twice that length. Mobile devices will only show about 45-90 characters, so put the most important details, like your brand and keyword, up front. Bullet Point Formatting: Aside from keeping your bullet points short and precise, you can use symbols or capitalization to draw attention to key points. The average shopper will likely skim your listing for 15-30 seconds before making their next move, so use visual cues to your advantage. 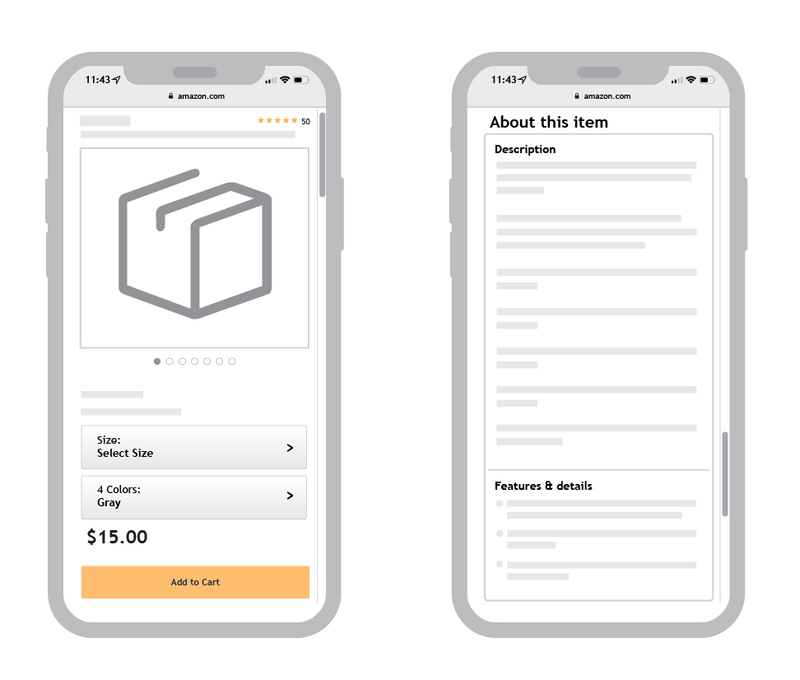 Description Length: Amazon will start shortening your product description after 150 characters on both desktop and mobile. While the product description should go deeper than your bullet points, you want to keep it concise. Favor important details over generic fluff and remember that if someone is taking the time to read this longer description, they may be closer to making a transaction. Amazon restricts the use of stylized text or HTML in your listings. 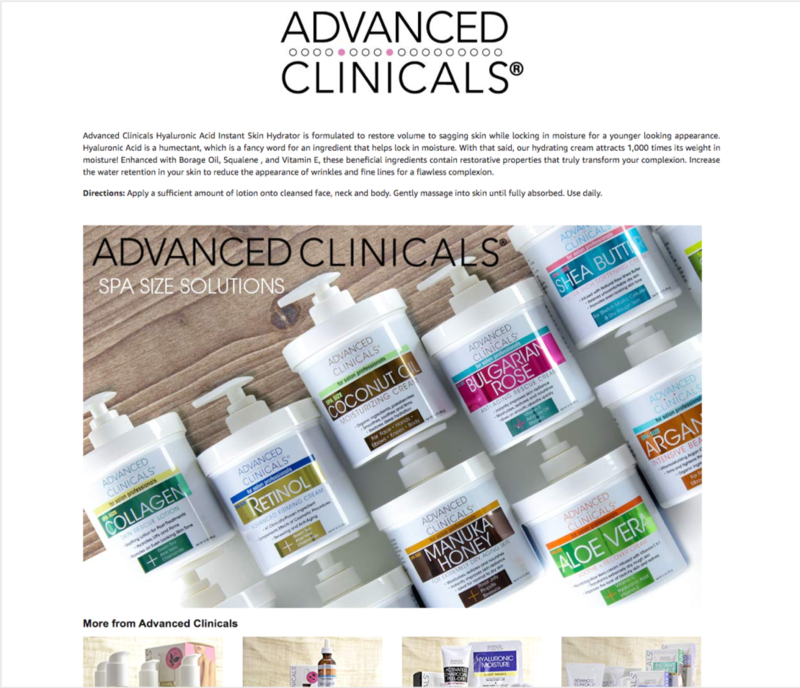 However, if you’re enrolled in Amazon’s Brand Registry or part of certain programs like Amazon Exclusives, you can use the Enhanced Brand Content (EBC) feature to jazz up your product detail pages. You can find EBC in you Amazon Seller Central account under the “Advertising” tab. From here, you’ll be prompted to enter a SKU and choose between five templates. While it takes more work to set up and there’s limited data on EBC’s actual impact on conversions, EBC lets you put your best foot forward. You can get creative with branded pictures, dynamic text and eye-catching content modules. There are some restrictions and rules of thumb around EBC, such as excluding any mention of pricing or promotion details. It’s not uncommon for content to be rejected the first time, but Amazon will either approve or disapprove your EBC within seven days of submission. A picture speaks a thousand words when it comes to ecommerce. Your images should not only be clearly shot against a white background, but should also show your product from multiple angles. Provide at least three pictures that meet Amazon’s Image Requirements and, if appropriate, show your product in action. Videos can give you an edge, but is limited to Professional sellers with EBC access. Alternatively, you can encourage customers to leave video reviews, which will be highlighted above the customer reviews section. Of course, we can’t ignore the importance of price. Needless to say, it has a big influence on your conversion rate and your Buy Box status. Therefore, it’s important to have a repricer that dynamically (and responsibly) adjusts your price according to competitors and your own profit margins. Most sellers prefer algorithmic repricers over rules-based repricers. While rules-based repricers offer control over exactly who to reprice against and by how much, they fall short from being able to adjust prices against Buy Box owners specifically and bringing your price back up incrementally to increase profitability (while pricing according to your Buy Box ownership). Two-day shipping is the norm. Your chances of landing a sale (or winning the Buy Box on a competitive ASIN) without it are slim in a majority of categories. Most sellers that we work with will use a combination of FBA, 3PLs and their own warehouses to achieve this. Having multiple locations and delivery options is key to getting packages shipped quickly to any location across the country—as well as having the right warehouse setup and software. You’ll want to consider an automated warehouse management system (WMS) as your business scales to tackle multi-warehouse inventory, barcoding and workflow inefficiencies. Amazon has also started dipping its hand into gig services, including Amazon Flex, Logistics and FBA Onsite, that help you bring shipping options down. Read more about these fulfillment options here. Underneath all the glitz and glam of your listing, your seller performance quietly determines how highly Amazon ranks you. Amazon is incentivized to favor the buyer more than the seller, so any decisions around rankings are with the full customer experience in mind. Amazon factors in your late shipment rate, order defect rate (ODR) and pre-fulfillment cancel rate for every product you sell. Since consistency, speed and accuracy are the name of the game here, having the right workflows is important. You’ll want to automate repetitive or error-prone tasks as your business scales or approaches peak season to avoid big blunders that could trigger a shutdown of your Amazon account altogether. Listing to Amazon is as much a science as it is an art. Fortunately, many of these steps are repeatable and/or automatable. For questions on how to optimize your listings or streamline your workflow, give us a holler at [email protected]. Happy selling! View the top catalog management mistakes made by even the most established ecommerce sellers. Gain tips for preventing these errors from happening to you. Smaller catalogs perform better than large catalogs, but it's all relative to annual online revenue. Your revenue per SKU is an indicator of success. Product descriptions must be unique, tailored to the audience, focused, authoritative and credible. Learn the keys to high converting product descriptions.